With everything going Digital or Online, even signature has got its Digital Version, commonly known as Digital Signature Certificate or DSC. With Ministry of Corporate Affairs (MCA), Income Tax Authorities and Goods and Service Tax (GST) are already accepting online documents, applicant/taxpayer are now mandatorily required to sign documents digitally with the help of DSC only. Digital Signatures are legally admissible in a Court of Law, as provided under the provisions of Information Technologies Act, 2000. It means that a document with Person’s Digital Signature will have same validity as its physical signature which is path breaking as well as risky, as DSC can be affixed by any person who is in possession of DSC token and person receiving document may not be able to verify the same. 1. 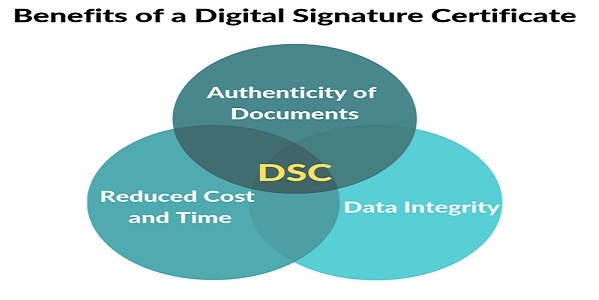 What is DSC (Digital Signature Certificate)? 2. How can I apply for DSC? 4. What are the Benefits of a digital signature certificate ? 8. How much time do CAs take to issue a DSC? 9. In Addition to MCA, where can I use my DSC? Digital Signature Certificates (DSC) is the digital equivalent (that is electronic format) of physical or paper certificates. Few Examples of physical certificates are drivers’ licenses, passports or membership cards. The Certificates serve as proof of identity of an individual for a certain purpose; for example, a driver’s license identifies someone who can legally drive in a particular country. Likewise, a digital certificate can be presented electronically to prove one’s identity, to access information or services on the Internet or to sign certain documents digitally. A digital signature certificate (DSC) contains information about the user’s name, pin code, country, email address, time of signing and date of issuance of certificate and name of the certifying authority. Application of DSC is required to be made in physical form along with self attested copy of PAN card (Mandatory for IT and MCA Filing of local resident) and 1 Address Proof (Preferably AADHAR Card). The application form vary depending on the vendor but it contains more or less same information. Once Application is submitted, the Certifying Authority (CA) will process the application and will send one confirmation message on applicants mobile number for verification along with Video Verification. On completion of mobile & Video verification, the DSC will be issued in the name of applicant. A licensed Certifying Authority (CA) issues the digital signature. Certifying Authority (CA) means a person who has been granted a license to issue a digital signature certificate under Section 24 of the Indian IT-Act 2000.The list of licensed CAs along with their contact information is available on the MCA portal. Class III DSCs –This is the highest level where the person needs to present himself or herself in front of a Registration Authority (RA) and prove his/ her identity, used where the risk of data compromise is at the extreme level. In this case, also, the signature is installed in a hardware cryptographic device. Address Proof – Self-attested Aadhar Card or such other address proof as may be accepted by CA from time to time. Other – 1 photograph, unique email id and unique contact no. along with DSC application form. Generally all DSCs can be issued within 1 or 2 working days. However, issuance of DSC is generally dependent on the confirmation by the applicant. Digital Signatures are legally admissible in a Court of Law, as provided under the provisions of Information Technologies Act, 2000. The acceptance of DSC is still not universal, however, various government authorities like Income Tax, GST etc have made it mandatory to use DSC for various applicants and it is voluntary for few exempted class. However, in near future it is expected to grow its presence and requirement with many other services. A person can have different DSCs – however, generally all government websites have a specified a requirement of registering a DSC with the respective government server. Once registered, no other DSC can be used, unless new DSC is registered with the server again. DSCs are issued for 1 or 2 years. After their validity has expired, they need to be issued again. Digital Signatures are legally admissible in a Court of Law, as provided under the provisions of Information Technologies Act, 2000. About Author: CS Jigar Shah is the Founder and Partner at JMJA & Associates LLP. With over 10 years of work experience in various listed companies and conglomerates, CS Jigar Shah has a rich and varied experience in his portfolio. can one person have two DSC,? and if yes, than unique email id and mobile number is required.? I dont remember if any law specifically prohibiting the same. However, if at all person applies for 2 DSCs, he will need another set of Mobile and Email ID as same is not accepted by DSC processing authorities.